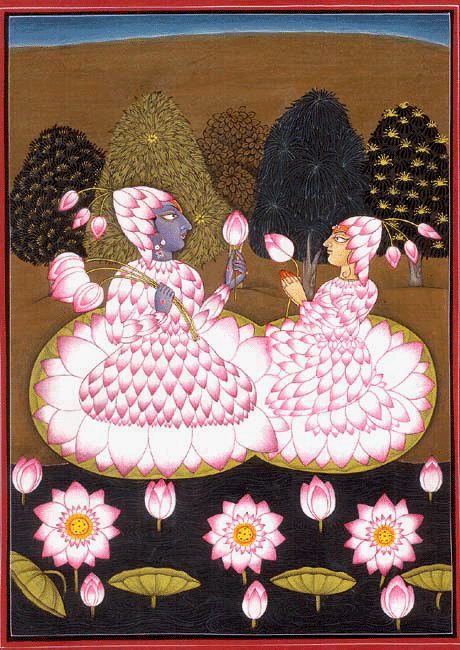 Clad entirely in lotus petals and sitting on lotus thrones, Radha and Krishna here gaze intently into each other's eyes. Images of Radha and Krishna in flower adornment (phulsajjya) are somewhat rare, and the absence of inscription to accompany such paintings prevents a precise definition of the significance of this divine Lila. Lotuses, however, are multivalent symbols with a long history of use in the religious imagery of the Indian subcontinent. Since lotuses rise gleaming and fresh out of muddy ponds, they generally represent fertility and purity. The lotus-petal garments further suggest a common act of devotional worship through the offering of flowers to the gods. Within the specific context of the worship of Radha and Krishna, the lotus may refer to the blissful union of the two in the land of Brindavan, Krishna's childhood home. Pilgrimage maps often depicted Brindavan in the shape of a lotus. Radha's lotus braid is a charming extra detail added by the artist. 1. flower crown, 2. flowers in the hair, 3. flower earrings, 4. flowers decorating the forehead, 5. flower necklaces, 6. flower armlets, 7. flower sashes, 8. flower braelets, 9. flower anklets, 10. flower bodices and many other kinds of flower ornaments. Just as these ornaments may be fashioned from precious jewels, gold or other materials, in the same way they may be made of flowers. Angada (armlet): A flower-armlet (angada) may be fashioned of three kinds of flowers strung one after another to resemble a little flower creeper. Balapasya: A garland of flower buds and similar ingredients closely strung together and placed on the hair is called balapasya. Candratapa (an awning): When many sindhuvara flowers as white as pearls decorate the sides and fresh lotus flowers hang down in the middle, the awning is called candratapa. Chatra (parasol): Made of thin white sticks, decorated with white flowers and with a handle decorated with yellow jasmine flowers, a flower parasol is called a chatra. Crown: The divine couple's crowns may be made of rangini flowers, yellow jasmine flowers, navamali flowers, sumali flowers, dhrti gems, rubies, gomeda gems, pearls or splendid moonstones. These may be artistically arranged to construct beautiful crowns. The crowns may be made with seven points and they may also have gold ketaki flowers or various flower buds among their colorful and beautiful ingredients. These crowns enchant the mind of Lord Hari. The flower crowns known as puspapara are the best of all and they are more pleasing than even the best jeweled crowns (ratnapara). Lalita-devi learned how to make these puspapara crowns from Srimati Radharani. These puspapara crowns are made with flowers and flower buds of five different colors arranged in five points.s This crown is especially used to decorate Srimati Radharani. Decoration for the Forehead: A garland of flowers placed on the upper forehead along the hairline is called lalatika. Such a garland should have flowers of two colors : red in the middle of the garland and the other color flowers on the two sides. Earrings: Skilled craftsmen say there are five kinds of earrings. They are known by the names tadanka, kundala, puspi, karnika and karna-vestana. Graivekyaka (flower collar): Made of a single kind of flower, a necklace strung four times around the neck is called graiveyaka. Hamsaka (flower shoes): When the decoration of flowers covers the entire top and side parts of the feet and there are bunches of flowers in four places, such a decoration is called hamsaka. Kanci (sash): A sash made of flowers of five different colors, artistically strung together in a gently waving pattern, is called a kanci. Kanculi (flower bodice): A bodice made of flowers of six colors, artistically arranged and perfumed with musk and which begins from the neck, is called kanculi. Karnika: The karnika earring is fashioned from the whorl of a blue lotus surrounded by yellow flowers. In the middle are a bhrngika flower and pomegranate flower. When the flower earring is so large it completely covers the ear, the earring is known as karna-vetsana. Kataka (flower anklets): Anklets made of many different flower buds are called kataka. These are of many different varieties. Kundala: When an earring is fashioned from flowers in order to resemble a certain object, the earring is called kundala. There are many different kinds of kundala earrings. The flowers may be arranged to resemble a peacock, shark, lotus, half-moon or many other things. Mani-bandhani (bracelet): A bracelet made of flowers of four colors, with bunches of flowers hanging down at three places, is called mani-bandhani. Puspi: The puspi earrings is fashioned from four different kinds of flowers placed in a circle with a large gunja berry in the middle. Sayanam (couch): The couch is fashioned of campaka and malli flowers and decorated with small bells. It has a large cushion of navamali flowers. Tadanka: A hollow gold post worn in the ear is called a tadanka. This kind of earring is of two varieties. In the first variety the petal of golden ketaki flower is attached to this earring. In the second kind the petal of some other colorful flower is attached. Ulloca (an awning): An awning is made of a latticework of various colorful flowers, ketaki petals and various leaves. Many malli flowers hang down from this awning. Vesma (cottage): With reeds as pillars and various colorful flowers as the roof and four walls, a vesma (flower cottage) is constructed.